I love it when I have the opportunity to explore new candle companies completely new to me. And that’s one of the beauties of Candlefind… trying companies I never would have found on my own otherwise. Reviewing also gives me (and you) a different perspective outside of just being a consumer… I don’t just critique the candles, I also learn about the company behind them – their roots and background and how they began… and Madison Valley has a great entrepreneurial and unique story. Madison Valley began in 2004 when the founder, Sean Wheeler started mixing and pouring candles out of his garage. Isn’t that how the greatest companies start… from a garage? I think so! And Sean’s story is not your typical “I hated store bought candles and decided to make my own.” Nope. He bought a candle making kit so he and his daughter could do something fun together… a father and daughter project that ended up turning into a passion. 5 years later, he perfected his recipe and went with 100% pure soy wax and fragrance oils that are certified organic, kosher and vegan. In fact, I think they take “all natural” a step further. Madison Valley is part of a co-op that produces non-gmo soybeans. From there, they build their own wax so it’s literally produced to their specs with their own ingredients. Who does that?!! You hear that natural candle lovers? Here is a brand that has your name written all over it. LOL! 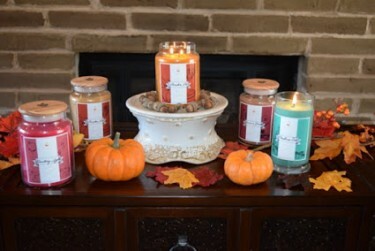 Their fragrances are also custom made to their specs and not your standard oils other candle companies’ use which gives them a more unique edge to their competition. As of today, you can purchase their candles online through their website or locally at many Hallmark stores across the country. Not bad for a guy who bought a candle kit to simply have some fun with his daughter. I love these stories!! This brand has also been featured on The Today Show, QVC and The Oprah has even contacted them for samples as part of her Favorite Things List. How cool is that?? Another added bonus…. you can customize your candles when you place your order. What does that mean? It means you get to choose your size, style, scent, color and wick options from cotton wicks to crackling wood wicks. It’s all up to you. Browsing their site more, they also offer many different choices from pillars, tea-lights, votives, tart and block melts as well as gift baskets which – by the way – we will be giving one away valued at $95.00 in honor of the next review we’ll be doing. WOOHOO!!!!! Details on that coming up soon! For my first experience, I chose 3 scents I thought would be fun to review. Honey Ham –This will be a first for me. I seriously had no idea what to expect but thought it was too unique to not review. Spicy Pears – YUM! What a perfect scent to burn during cold weather. Sweet and spicy all rolled up into one. And last but not least…. Sweet Sugar. Need I say more? I have a serious sweet tooth and this one sounded perfect. Tangy cranberry and juicy red apples combined with just the right amount of sugared cinnamon spice. Perfect all year around! A soft vanilla custard with a hint of caramelized sugar makes this is warm and delicious scent. This soy candle is known for its rich fragrance that captures the warmth of a real pumpkin pie. Ginger, cinnamon and nutmeg combine with vanilla in a pie crust aroma that evokes a freshly baked dessert, complete with homemade goodness. Are you a fan of delicious cake pops? Rich, ripe berries mixed with hints of sugary sweetness and a bit of a sassy kick make this soy candle’s scent extra strong and scrumptious. Ocean Mist scent description - A ‘greatest hits’ of the island's florals, our Hawaiian-inspired candles combine orchid, tuberose and awapuhi with a hint of vanilla, sandalwood and a light musk. Say Aloha to your new favorite fragrance! Spicy Pears from Madison Valley Candles is pretty amazing and I've tried my fair share of pear scents. This version smelled very realistic... sweet pears dusted in touch of cinnamon spice. It was literally perfect! Searching for a unique holiday scent to burn this year? Try Honey Ham from Madison Valley Candles. Yup, you read that right... Honey Ham. I decided to review this fragrance on a whim and oh my goodness was it unique and flavorful. It truly did smell like a honey baked ham I purchase every holiday season. Mmmmm! !